Oh man. I feel super guilty for not tracking the progress of my pregnancy with baby boy. I tracked Kess' weekly & it was so dang fun. It just wasn't in the cards for this little guy. I swear we have busy and on the go his entire pregnancy. I felt pretty strongly that this baby was a boy from the beginning. My Chinese gender chart even told me so. ;) I had a few weeks of thinking I was probably totally wrong & began panicking because I had zero idea what I would name a baby girl. And now I know it's a boy & I still have no idea what I'm going to name him. We've narrowed it down, but will probably decided when we see him. We found out at our anatomy ultrasound that baby's placenta was up front, which brought some relief as to why I hadn't felt him much. Matt & I both felt Kess move at 17 weeks. He didn't feel baby boy move until after 25 weeks. Crazy right? We are getting some big waves, kicks and punches now though. I love it! My pregnancy with this little boy has been easier than Kess' in most ways & much harder in some. I wasn't as sick, I didn't throw up as much & I haven't had to stop contractions. I have, however had several migraines & some pain that I attributed to contractions. After 3 urine tests over the course of a few weeks they thought I was having bladder infections. Turns out, it's not a bladder infection but a irritable uterus. I didn't know that was a thing. I have found if I'm careful to not work too much, or be on my feet too much then I can stay relatively pain free. I have also started taking over-the-counter magnesium which helps with lots of things like uterine pain, leg cramps & insomnia. I'm at 29 weeks now & am starting to have swollen ankles. I only got swollen ankles twice with Kess. Once when I "helped" Matt organized the garage & again after my baby shower at 34 weeks. I'm not so sure what's happening now, but I like an excuse to put my feet up and rest. I can't tell if I'm more fatigued and sore with him, or if the fact that I have a 2.5 year old to chase after is playing into that. Moving twice during one pregnancy isn't ideal, but I'll be super happy to finally be settled in McCall. Hopefully in time to finish baby's nursery before he arrives. I used to do theses questionnaires every week when I was pregnant with Kess. I thought they might get annoying, but everyone loves to read them & chime in, so I'll do a quick one for you! How far along? 29 weeks to the day. Total weight gain/loss: Freak, I'm not sure I should answer this... probably 25ish lbs. Probably going to go over my max weight with Kess. That's what I get for not working out. Maternity Clothes? THESE jeans are my favorite. THESE leggings are perfect. THIS shirt fits my belly so cute like! Stretch Marks? Oh yes. I got some on my belly with Kess. They haven't seemed to change yet, but I'm counting on it. I have more on my inner thighs this pregnancy. Sleep? Not the best. I have to pee 5-7 times a night right now. I'm not sure if little boy hugs my bladder or what... it's killer. Miss Anything? Running & the motivation do to things. Movement? Lots this last week. With his placenta being up front I haven't got to feel him a ton. I do now though. It's so fun! Food Cravings? Does "All the food" count? Looking Forward to? Getting settled in McCall before he arrives! I'll be doing a post here soon sharing all the things that helped me get through the first trimester. Hi, One of my cousins currently pregnant with her first baby. I want to give her some maternity clothes. My friends suggested me to visit this site and take some clothes for her. I also visit here and saw lots of maternity clothes collections. 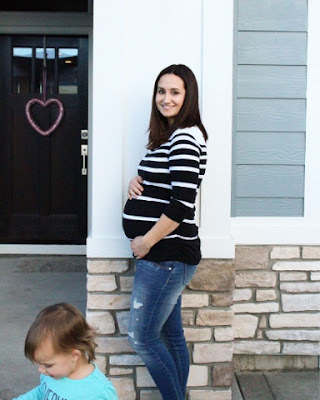 If you are also looking for maternity clothes like me. You can visit here.